TIP: A FORMER ORIENT EXPRESS STOP. DO NOT MISS THE STEAM LOCOMOTIVE WHICH CAN BE FOUND DIRECTLY NEXT TO THE TRAIN STATION. Zagreb Train Station is the largest and main railway station in Zagreb. Located in the city centre, opposite the King Tomislav Square Park and close to major Zagreb attractions. Built in neoclassical style in 1892. It is a 186.5-metre long palace and as such the largest railway station in Croatia. It was reconstructed twice, in 1987 for the Summer University Games and again in 2006. Here you will find public buses, taxis, local and regional trains. Zagreb Central Train Station is home to a supermarket, bakery, underground shopping centre, bathrooms, showers, luggage storage and a lost-and-found office. There is NO train from Zagreb Train Station to Zagreb Airport. We recommend taking the regular bus transfer from Zagreb Bus Terminal. There is no restaurant at the station itself. The nearest fast food restaurants can be found in the underground shopping mall, located by the station. Look for the stairs or escalator on the left as you leave the station. McDonald’s is at the south entrance of the underground shopping mall. Head left once you go down the stairs. The Lost and Found contact centre is open daily from 5 AM till 11 PM., you can contact them by Phone +385 1 378 2583 or Email [email protected]. Fill out the lost and found request form for help finding lost items on the train, you can download a [PDF] or [WORD] lost and found form. Lost and Found items are kept for 8 days. After the deadline has passed the items are moved to the local Police department. There are self-service lockers to store luggage. They are available from 6 AM till 10 PM and are located next to the main hall. On the opposite side of the ticket office. The price is 15 HRK per day. The lockers only accept 1, 2 or 5 HRK coins. There are no change machines nearby so have your change ready! There is limited accessibility to different platforms. By stairs only! From 5 AM till 6 AM and from 10 PM till 11 PM you can enter the station from the platform side. During off hours you can buy train tickets with the conductor. What can you see and do at Zagreb Train Station? A great place to start a pleasant and relaxed walk through Zagreb. The building itself is impressive and we recommend you to see it. Inside you will see high ceilings and enormous halls but slightly gloomy after the majestic outside view. Right next to the Zagreb Main Station is a steam locomotive. Next to the post office building, on the east. Close by you can find Zagreb Botanical Gardens and the Art Pavillion. 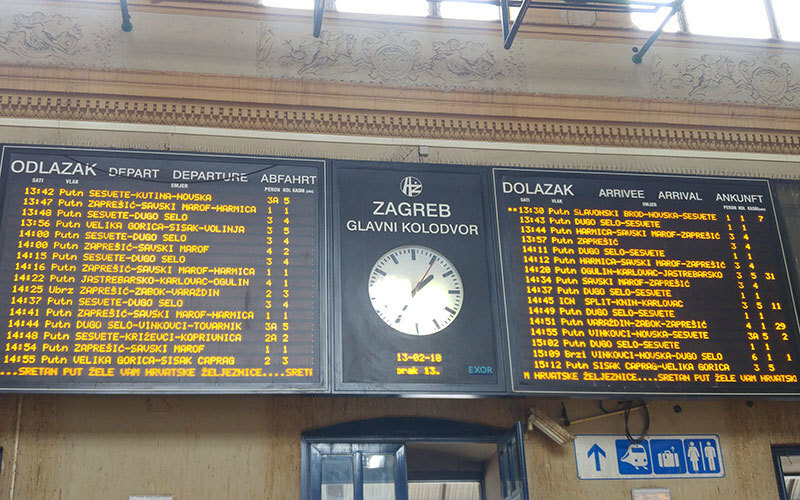 How to get to and from Zagreb Train Station? The train station is located south of the Ban Josip Jelačić square. It is 2 tram stops, no. 6 or 13 heading east, from ban Josip Jelačić Square. The train station is located in the city centre and a major hub for most public bus and tram lines. Close by you can find an underground parking garage. At the station, you can stop to drop off passengers or you can park at Parking Zone 1. Please read our guide on Zagreb parking for more information. The contact centre is open from 5 AM till 11 PM.